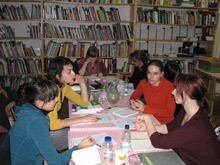 On Saturday, 14th November 2009, a group of students gathered in a Project room of SCCA and with their mentor Petja Grafenauer they tackled the problem of writing about the exhibition of contemporary art. The introductory presentation for the participants was followed by the visit to the exhibition Around the world of art in 4.380 days in the Alkatraz Gallery, where they met with curator Saša Nabergoj and assistant Sonja Zavrtanik. The curator presented the concept of the exhibition, a selection of works, the project itself, the World of art programme and some of her own experiences in setting up the exhibitions. 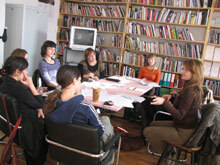 The group then returned to the Project Room to hear the mentor’s lecture on the establishment of modern art in Slovenia, and she also touched the topics of modernism, art institutions and project events in our area. Students become acquainted with important literature and they concentrated on further reflection on the themes of contemporary Slovene art. After a general lecture they returned to the topics of the exhibition which was later evaluated at home by the students who also wrote a text. The best critique will be published in the magazine Artwords; Petja Grafenauer also reminded them to have in mind a particular circle of readers and the status of the magazine while writing the text. In the final part of the workshop the students developed an in-depth debate on various artistic works from the exhibition, which served as a preparation for their individual work. 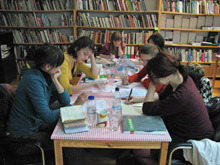 The students delivered their texts on 19th November; they met again on Tuesday, 24th November 2009 when the mentor talked about each of the contributions and pointed out the advantages and disadvantages and possible revisions of their texts. 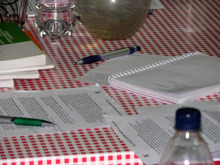 Editorial work was then undertaken by the students and they discussed all the texts. Since all the students had already been in contact with contemporary art and theory it was easier for them to evaluate and articulate their opinion. 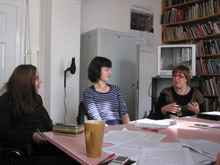 After the workshop Petja Grafenauer and Saša Nabergoj selected the critique by Lara Plavčak to be published in the next issue of Artwords.